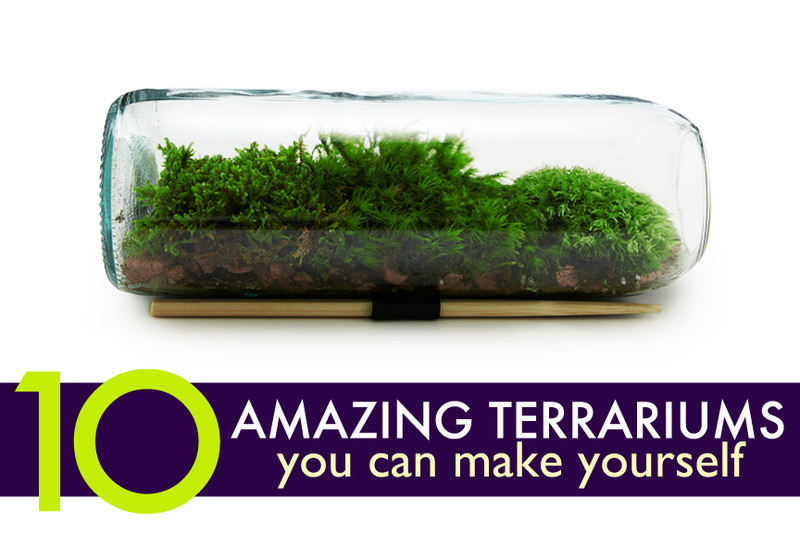 DIY: 10 Amazing Homemade Terrariums That Make Perfect Holiday Gifts! Terrariums make great holiday gifts, so we've collected 10 unique ideas for building a beautiful plant-scape in repurposed containers. Terrariums can be made with either leafy plants life ferns, or with water-storing varieties, such as succulents or cacti. Because terrarium plants need little soil and water, they can be made from containers of all sizes. 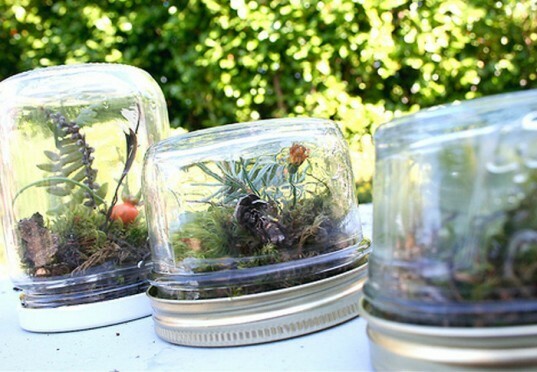 Check out these suggestion for tiny (and even wearable) DIY terrarium gifts! Spruce up boring glass ornaments by turning them into terrariums. You can use any clear glass ornament that has a removable hanger. We suggest repurposing an old ornament, or finding on at your local thrift store, but you can also find them at craft stores. Fill the hollow area with soil and small plants to complete the look. All the details for the how-to can be found here. 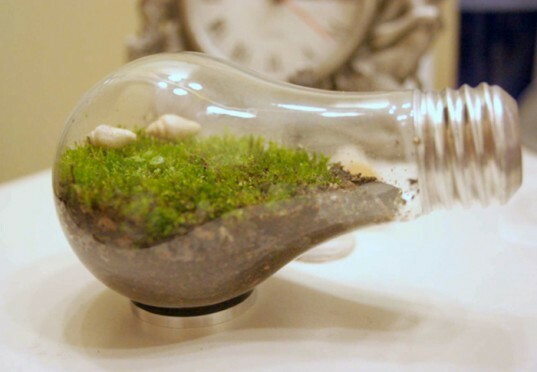 Get the look of a “ship in a bottle” by building your terrarium into a repurposed bottle laid on its side. We suggest using a tall cyclindral bottle, but you could experiment with smaller soda bottle or odd shaped. You may find a local glass cutting shop to take off the top in order to make a wider opening to plant, or your can carefully cut it yourself using string and nail polish remover. If you love this look, but are not looking to get into a DIY project, you can purchase all of the materials as a kit from Uncommon Goods. Succulents and cacti need very little water and soil, so don’t exclude very small containers as possibilities for terrariums. You can use any small container with a clear lid to get this look. Slide the clear cover so you expose just more than half of the opening. Layer your rocks, charcoal (optional) and soil as pictured above. Plant mini water-storing varieties and arrange small pebbles around then as decoration. Glue a rare earth magnet to the back side to hang on any ferrous metal surface. More details on how to make this magnetic container can be found here. 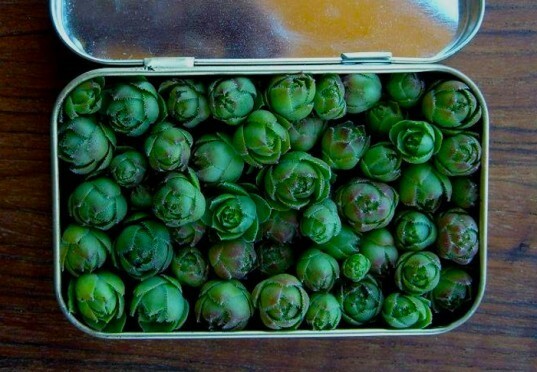 What could be more surprising than giving a tiny tin that opens to reveal a garden inside? Use a small tin from mints (Altoids), candy, or even a sardine tin with a roll-top. Give a shallow layer of soil and plant small succulent seedlings. To get the look pictured, plant the seedlings close together. You can also space them out and all moss or sand to fill in. If you want to continue your gift theme of reused tins, try making a mini tin BBQ, or package your own lip balm! If you still have incandescent bulbs around, one is bound to blow out any day. Use this opportunity to upgrade to a more sustainable light source, and repurpose the edison bulb into a terrarium. Follow the step-by-step to add your soil, moss, and finish the gift! 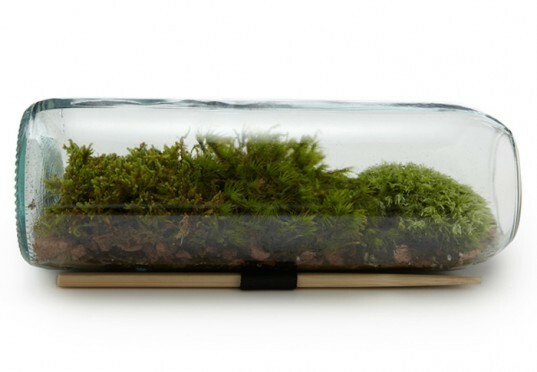 For fashionistas on your list, make them a wearable terrarium from an apothecary bottle. Corking the top will create the perfect mini rain forest-like environment for a tiny seedling. More details to get this look here. Many terrarium plants need very little soil, meaning you can even plant them into a seashell! Check your local thrift store for rings if you don’t have one of your own to repurposed. If you don’t live near a lovely beach with shells, you can also use the shell from a nut, or any other hard-sided natural material. Fill the hollow area with soil, plant the seedling and use a industrial strength glue (such as E6000) to attached to the ring. 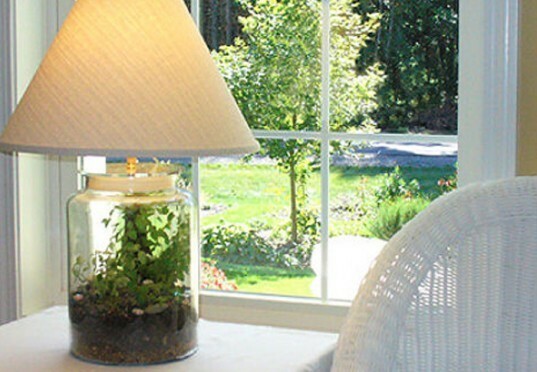 For a larger sized gift, we love the idea of a lamp terrarium. You can use any generously sized clear glass container together with a lamp kit. Layer the container with your rocks, charcoal (optional) and soil and then choose to arrange your leafy greens. We suggest using a low heat, sustainable light source for the lamp. It will save energy and not over heat your plants. Many people have seen terrariums made in glass jars, but give them something unexpected by building one upside down. Choose any jar with a shallow lipped lid. Layer your rocks, and soil and then arrange small seedlings and moss. We love the idea of adding holiday decorations to the terrarium. Find tiny reindeer or elves from broken ornaments and add them to your plant scape! More details on the how-to can be found here. 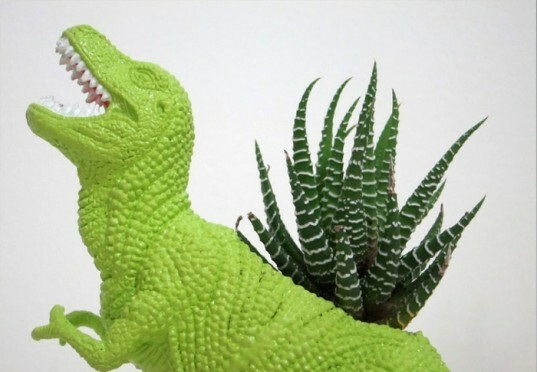 Make a really fun terrarium from old toys that are no longer loved. Many plastic toys are hollow inside, so you can cut an opening for you plant and starting layering your rocks and soil. Stick in a lovely aloe or leafy green. If you want the look, but not all the work, Crazy Couture has there great terrarium ready for purchase. These are great Lea. My kids and students love adding TickleMe Plants to their terrariums. Its the only plant that will close its leaves and lower its branches when tickled. We found TickleMe Plant Greenhouse (like a terrarium) kits on line. 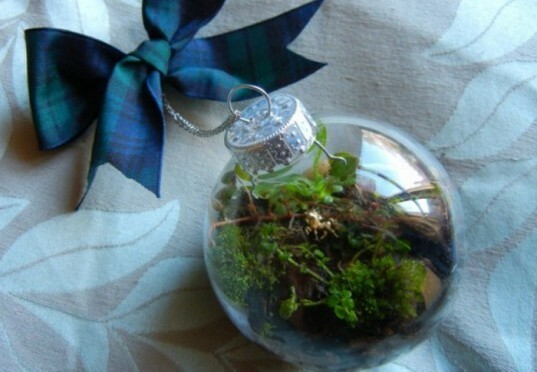 I love these terrarium ideas for holiday gifts. I just stuck some aloe in a pot the boring way, but now I'm thinking of doing this as well. Thanks! Thanks for sharing Leticia. Love that your terrarium is wall hanging. I got really obsessed this holiday and planted 6 new terrariums! I also invented my own terrarium, take a look at my blog: http://revolucaonoquintal.blogspot.com.br/2012/11/terrario-diferente.html ! What a great idea! They look wonderful and I've seen these bottles at inexpensive prices too. Terrariums make great holiday gifts, so we've collected 10 unique ideas for building a beautiful plant-scape in repurposed containers. Terrariums can be made with either leafy plants life ferns, or with water-storing varieties, such as succulents or cacti. 2. Cut off Bottle Terrarium Get the look of a "ship in a bottle" by building your terrarium into a repurposed bottle laid on its side. We suggest using a tall cyclindral bottle, but you could experiment with smaller soda bottle or odd shaped. You may find a local glass cutting shop to take off the top in order to make a wider opening to plant, or your can carefully cut it yourself using string and nail polish remover. If you love this look, but are not looking to get into a DIY project, you can purchase all of the materials as a kit from Uncommon Goods. Succulents and cacti need very little water and soil, so don't exclude very small containers as possibilities for terrariums. You can use any small container with a clear lid to get this look. Slide the clear cover so you expose just more than half of the opening. Layer your rocks, charcoal (optional) and soil as pictured above. Plant mini water-storing varieties and arrange small pebbles around then as decoration. Glue a rare earth magnet to the back side to hang on any ferrous metal surface. More details on how to make this magnetic container can be found here. 6. 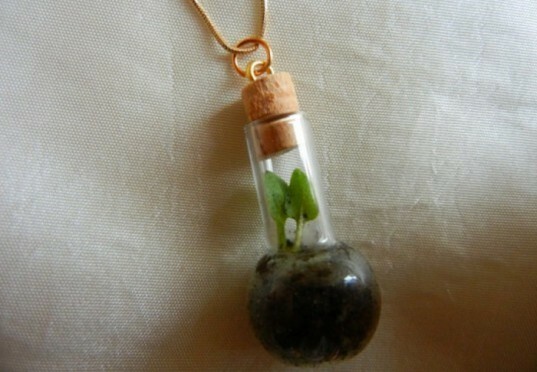 Necklace Terrarium For fashionistas on your list, make them a wearable terrarium from an apothecary bottle. Corking the top will create the perfect mini rain forest-like environment for a tiny seedling. More details to get this look here. 7. 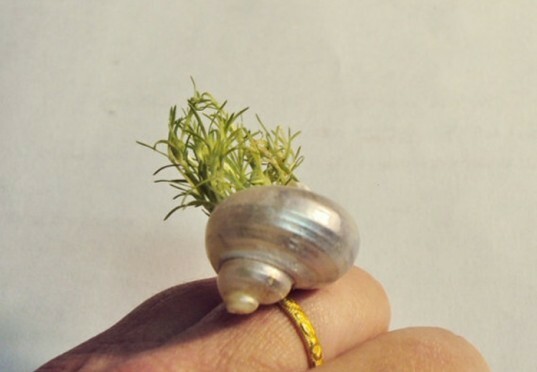 Seashell Ring Terrarium Many terrarium plants need very little soil, meaning you can even plant them into a seashell! Check your local thrift store for rings if you don't have one of your own to repurposed. If you don't live near a lovely beach with shells, you can also use the shell from a nut, or any other hard-sided natural material. Fill the hollow area with soil, plant the seedling and use a industrial strength glue (such as E6000) to attached to the ring. 10. 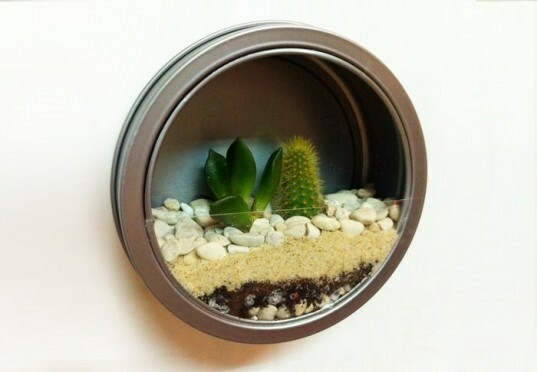 Upcycled Toy Terrarium Make a really fun terrarium from old toys that are no longer loved. Many plastic toys are hollow inside, so you can cut an opening for you plant and starting layering your rocks and soil. Stick in a lovely aloe or leafy green.